Performers rehearsing for the opening night of West End & Broadway at the Harlequin Theatre. Photo supplied. Harlequin Musical Theatre brings the sounds of London and New York to Auckland in its season of West End & Broadway. This cabaret-style revue takes you to the very heart of theatre land with its mix of music from some of the most successful musicals of all time. Journey from 1879 to 2016 with long-running season classics from The Pirates of Penzance, The Sound of Music, Oliver, Matilda and Anastasia. The show is directed by Aaron Tindell who is no stranger to the Auckland Musical Theatre scene and has directed recent successes such as, And The World Goes Round featuring Tina Cross, Bare: A Pop Opera, Nine and Gothic horror mini-musical-revue, The Red Chair cabaret experience. 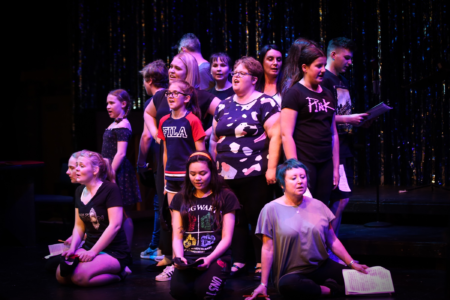 West End & Broadway features a cast of seasoned musical veterans working alongside up and coming junior performers, like 13-year-old Melody Lui-Webster . Melody has been performing since she was seven and has featured in a range of musical roles including the international productions of Annie and The Sound of Music. Also performing is Renee Maurice, 2013 Grand Winner of New Zealand’s Got Talent. A special treat for all patrons of West End & Broadway will be guest appearances by well-known Auckland theatre scene performers Caroline Everitt-Gardiner, Emma Carr, Steve O’Reilly, Verity Craft, Hamish Mouat and Jacquie Hudson. VIP cabaret style seating and platters options available. When: November 15-25; Evenings: 7.30pm; Matinees: November 17, 18, 24 & 25.